In America’s “bigger is better” culture, there is always the temptation to purchase more than we need. Our houses have nearly doubled in size over the past twenty years even as families grow smaller and, until the recent rise in gas prices, cars were growing faster than body builders on steroids. Everything is supersized on the general assumption that good things are even better when they are larger. In a consumer culture, the central question is not “What do I need?” but “What can I afford?” Pressure is constantly felt to take the next step up in quality, size or “value”. It’s a tension we feel whenever we go to McDonalds (for twenty cents more I can get the large fries), the car dealership (leather seats would be nice…) or the Caldwell Banker agent (won’t my friends be impressed with the cathedral ceilings!). A dozen times a day we are given an opportunity to feel special and pursue the elusive goal of social status simply by spending more and trading up. It’s consumerism run amuck and, Great Depressions notwithstanding, we seem powerless against its dynamic force. Boats are no exception. Indeed, boating seems especially prone to this kind of pressure. In the status and style conscious world of sailing, there is always a boat that is a little bit bigger, a little bit nicer, a little bit sleeker. A 22-foot sailboat looks cramped next to a 24-foot boat. But wait! Both look like subsidized housing compared to the 40-foot sloop that just filled the berth next door. For years, I resisted the lure of sailing precisely because I didn’t want to play these games and get sucked into the status-seeking culture of the “yachting class.” In a world where the world’s richest men compete to own the world’s largest yachts and corporate executives treat sailboats as fashion accessories, it is a game I would lose. In the end, everyone loses. When possessions are simply expressions of our status we inevitably feel the restive pull of “more.” The internal compass the tells us that we have enough, that allows us to find satisfaction in what we have, is disrupted and we find ourselves heading off toward a receding horizon, forever in search of material happiness. But there is another way. We can reject the disorientation of the consumer culture simply by taking control of the means of production (to quote Marx out of context). In other words, we can opt out of consumerism by choosing to make our own possessions. Building, I believe, is not simply a slightly longer and harder way to get stuff (as some people assume). Instead, people who make things have a fundamentally different relationship with their possessions. Builders are not consumers. Instead, they are creators. Value is not expressed in the dollars spent, but in the labor given, the problems solved, and the ideas generated. Physical work—not cash or credit—brings the object to life. Pride of ownership comes from completing the task and bears little or no relationship the dollars spent. A quilt made from scraps can have greater value than a cashmere sweater; a plywood boat can inspire more pride than a teak-trimmed sloop. Of course, I must purchase raw materials—plywood and glue, screws and bolts, among countless purchases large and small. But when I look at my boat, I don’t see the money spent (about $1,300 so far). Instead I only see time and effort—the hours spent learning to loft curves, to glue stringers, to mix epoxy, to solve countless small problems in my own way. The result is a more reasoned and reflective relationship with possessions. When I build something useful, I’m not thinking about what is most fashionable or about how I can get the most for the money; instead I am thinking about what I actually need and what best reflects my personal tastes and values. And from this, comes a greater, more authentic sense of worth. And the dividends continue after the boat is finished. A fifteen-foot boat fits easily in my garage, can be towed behind the family van, and (I’m told) is easily launched. In addition, maintenance costs are minimal; a boat that is simply built is also easily fixed. While large boats required countless ongoing fees—docking, hauling, repairing—I have all the space, supplies and experience needed to keep the boat in the water. I’m fully qualified to oversee maintenance since I’m the guy who built it in the first place. Nothing is a mystery; nothing is beyond my skills. It might be too much to say that a boat is an expression of simplicity. After all, even a small boat requires time and money. The easiest way to save expenses is to not have a boat. But in a society that is always pushing us to buy our entertainment and purchase beyond our means, it is not too much to argue that amateur boatbuilding is an act of rebellion and the decision to make the most of a small boat is a statement of values. This entry was posted on Friday, December 11th, 2009 at 1:33 am and is filed under Building the Cabin and Seats. You can follow any responses to this entry through the RSS 2.0 feed. You can leave a response, or trackback from your own site. Well said and I agree completely. The world would be a better place by far if we all had a little of ourselves invested in our belongings. I 2nd Scott’s comment. I go sailing for the release from the overly complex world we have inherited. We sold our 34ft catamaran and moved on a 24 ft and have never had a regret. My goals all revolve around smaller is better. My goal is like yours, sail my 12ft open boat the length of the Bay this coming summer. That will be much greater challenge than motoring down the ICW, yawn how boring that was. Try the other ICW! I have traveled from Brownsville to Mobile and it is great. Really very few small craft and not a lot of barges. The towboat captains are really great and very polite on the radio. There are several locks and one swing bridge but none are a real problem unless being repaired and only open at night. This is rare. It can be a long way between towns and there are not a lot of water side facilities particularly in Texas. This ICW is really not developed for tourists so is quite enjoyable. Thanks for the encouragement and recommendations. I am still considering the ICW, but I also want to investigate other parts of the Great Loop. I’d enjoy hearing more about your experiences. I traveled on a very non typical boat. She was a 74’true paddle wheel boat. She draws very little water, less than 18″. She could run over 12 knots but we usually operated at about 10. I was stunned at the fuel consuption. I was accustomed to a 50 foot long liner that used about 10 gallons an hour and could not believe the gauge on the stern wheeler. I stuck the tank every day and finally accepted that I was using about a gallon an hour. Paddle wheel systems are very economical up to about 200 horse. The southern ICW has a few stretches of open water that bear watching but the weather forecasts are accurate and the wind is down at sunup and for several hours afterwards. This boat was slab sided and shallow so the wind was always a consideration. Most of the day I would crab at 10 degrees or more. Twice we laid over due to the high wind. It really pushes the barges around and I didn’t want to risk getting hit. We did see a dredge and it’s two tow boats do a 360 due to wind at a river crossing. Look at a map and you will see very few towns on the water so you will travel a lot of wilderness. Very good of you to share your thoughts and feelings with us, Paul. I very much second your sentiments in this post. 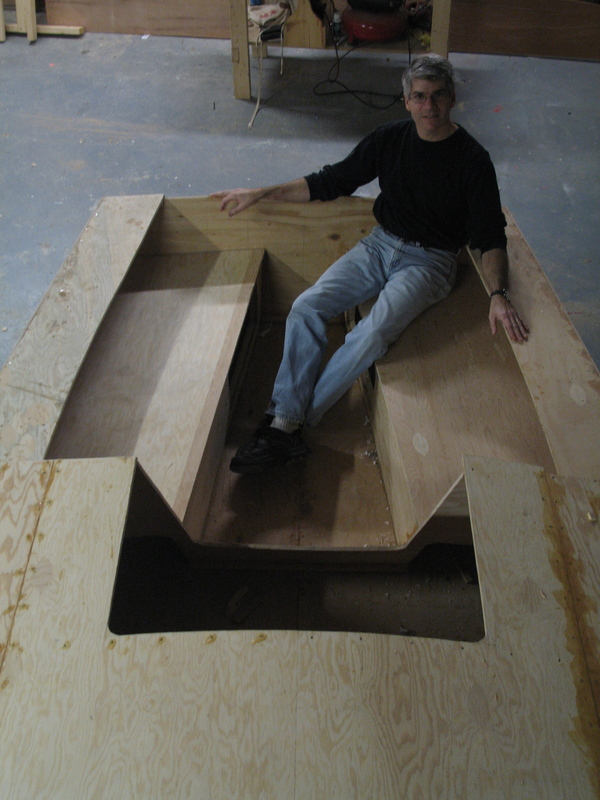 I have built a Glen-L Power Skiff 14′, and several other things – including my own house – and I think it gives different meaning to both the things and owning and using them. I would also like to quote George Buehler from his book “Backyard Boatbuilding” where he points out that nobody dares to do anything anymore without certificates or professional help or anything, we just sit around and watch tv. It’s very much the same things going on here in Norway, and I think it’s good to see that we’re not so different and that we experience the same kind of problems and challenges in our lives. I kind readily identify with your reasons for building a boat, and it’s very interesting to read your blog and feel like I almost have a remote friend on the other side of this great sea. It’s wonderful to find a kindred spirit in Norway! Please stay in touch. And if you’re ever on this side of the ocean, let me know. What a pleasure to hear of home builders/boat builders and feel the self-satisfaction of creating with your own hands. I launched my first boat at age 3 in 1943, it was wonderful, I stepped in and sailed away…it was great until the glue let go on the cardboard box. That was just the beginning of a lifetime of home made boats. My first favorite was a 8 foot two point racing hydroplane built at age 12. Over the years my dreams led me to my biggest, a 46 foot, twenty ton motor-sailor that my wife and I lived aboard for fifteen years…the best of my life! We were encouraged to write a book of our adventures and finally it happened. “Travels of Dursmirg” was finished this month and is available from Amazon books in paperback and Kindle. The story has made the front page of two newspapers this week that you can visit by clicking up our blog through our web site. Many a dreamboat is scuttled by procrastination.